How to export embeded file which from excel using POI? I have made a java basic program written below, which is making 3 kind of files (ppt,doc,txt) embedded in Excel sheet using Apache POI. Now this file I want to Export with its original format. How to do this? Reference link is Embed files into Excel using Apache POI. I have made program from this link. In short I want export functionality on Embedded file. So ,how to exporting functionality implement? This is partly a duplicate of How to get pictures with names from an xls file using Apache POI, for which I've written the original paste. As per request, I've added also an example of how to add and embedding with the help of a OLE 1.0 packager - in the meantime I've added the code to POI, so this easier now. For the OOXML based files have a look into this answer. So the code iterates through all shapes of the DrawingPatriarch and extracts the pictures and embedded files. // Mac Excel 2011 embeds pdf files with this method. // This shape was not a Mac Excel 2011 embedded pdf file. * Finds the first occurrence of the pattern in the text. // This shape was not a Mac Excel 2011 embedded pdf  file. * occurrence of the pattern in the text. * pattern is matched against itself. To simplify the processing of embedded data, I've added an extractor class to POI, which will be available in POI 3.16-beta2 or a nightly until then. The following will extract the objects of .xls/x files - all which is left, is to write the embedded bytes somewhere. It's possible to extend the extractor classes by simply extending EmbeddedExtractor and provide your own iterator() method. Not the answer you're looking for? 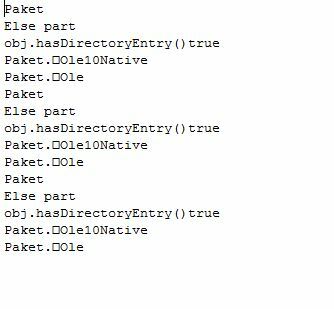 Browse other questions tagged java excel apache-poi ole embedding or ask your own question.